These sensors are Nellcor compatible, suitable for patient monitoring and for use in the ICU. The excellent performance makes theses sensors also suitable for sleep screening. The sensors are latex free. The ergonomic shape insures easy and prices placement, a good fit and maximum patient comfort. The sensor stays in place with clear, foam or cloth tape and insures that it is easily removable as well. All models come with a 45cm long cable with a DB9 connector. The price is EUR 175,00 for a box of 24 pcs. 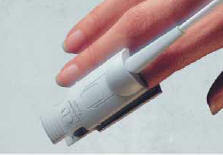 We can also supply you with reusable SpO2 sensors. These are available in many different types and connectors for, for instance, Nellcor, BCI, Ohmeda, Novametrix / Spacelabs, criticare, Datex Kontron. Extension cables and Y-Sensors are also available. Please contact us. The clips themselves are robust, and equipped with silicon pads and of course Latex free. The cables have been strengthened to withstand daily wear and tear. And they are easy to clean.